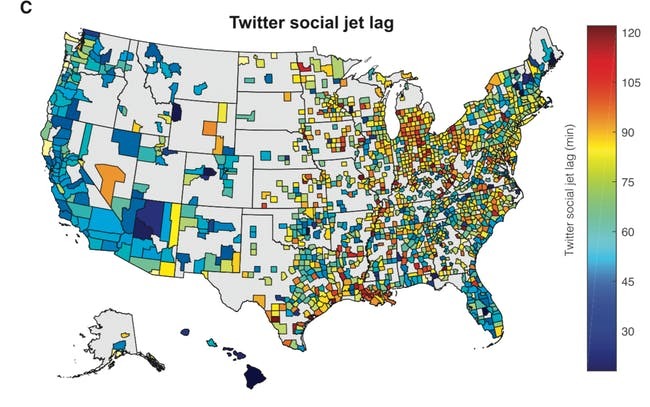 Inverse: Twitter Usage Data Can Map How Screwed Up Your Sleep Is - Scientists (biologists not geographers) at the University of Chicago are using tweets to explore U.S. residents' sleep loss. Esri: Policy Maps - This is a nice interface to data for the U.S. There's an intro video here. Popular Mechanics: 6 Reasons You Should Always Have a Paper Map - Roy Berendsohn shares the reasons paper maps are good to have around. Forbes: Lessons From Posting A Fake Map - Brian Brettschneider is a Contributor to Forbes. That means he was selected to be a writer and the publication pays him for his contributions. This is not "earned media" but more like "owned or syndicated." Spoiler alert: What do you learn? That posting such a map makes people angry. 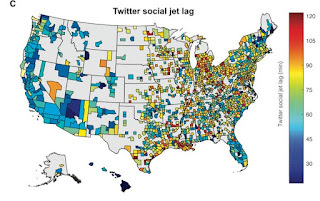 Forbes: Television And Geography As Big Data: Mapping A Decade Of Television News - Another contributor explores which which news locations get more TV coverage. Clever Elephant: Esri and Winning - Paul Ramsey looks at the challenges of one company dominance in a marketplace. The company is Esri and the marketplace is GIS. There's a discussion thread on Twitter and a second thread on Reddit. I speak only for myself: Students: you do yourself a disservice if you do not get your hands on more than one vendor's software during your studies. I felt so strongly about this some years ago that I wrote and taught a graduate GIS course called Comparative GIS. Stevens Point Journal: What we know about UW-Stevens Point's new majors cut, restructuring plan - The original list of 13 majors to cut has been trimmed to six, but geography is still on the cut list. Kentucky.com: A degree in bourbon distilling? UK plans to expand its online programs. - "[Matthew] Wilson said they’ve had about 170 students take digital mapping classes online and about half of them received certification in the field. From those students, the geography department selected about 12 for the online masters program." University of Denver: Public Domain Data for GIS - My colleague Joseph Kerski will teach this online, four credit course. LINZ: New Zealand tertiary GIS papers, programmes and contacts - A list of programs in New Zealand. It's a long list for a small country! University of Northern Colorado: GEOG 587. GIS Programming & Automation online will be offered in Spring 2019 (starting Jan 7). It's part of the GISci Graduate Certificate but can also be taken as a non-degree course. It's about $1900 for Colorado residents. Wallace State (AL): Wallace State Community College debuting Geospatial Technology degree in Spring 2019 semester - The school will offer a Geospatial Technology associate in applied science degree and a certificate. How is GIS used? "For instance, an individual might measure the best place to cultivate a specific farm based on geospatial data, analyzing soil samples, rainfall and other external factors." WFMY (NC): Guilford County Schools New Signature Career Academy Gears Up For The Future - Guilford County Schools Signature Career Academy includes majors including geospatial technology. Magnetic Media (The Bahamas): New geography curriculum on the way for high schools - "The new curriculum will upgrade the Ministry to 21st century standards. Ms. Baker also noted that there is an 'urgent' need for 21st century training in GIS." Australian Academy of Science: Geography: Shaping Australia’s Future - A strategic plan for Australian Geography was launched by the Australian Academy of Science’s National Committee for Geographical Sciences. The good stuff, that is, the challenges to the discipline and recommendations are in the very last chapter. MIT: GIS and Data Lab now open in Rotch Library - "A new GIS and Data Lab for the MIT community is now open in Rotch Library, bringing together the MIT Libraries’ programs in GIS (geographic information systems) and data management services in one location and expanding resources for statistical analysis, data visualization, text mining, image processing, and virtual and augmented reality." The Herald-Dispatch (West Virginia): College agreement focuses on geospatial data implementation for Milton - "An agreement between Mountwest Community and Technical College's Geospatial Science and Technology (GST) Program and the city of Milton marks the beginning of a cooperative agreement focusing on geospatial data implementation for the town." New Vision (Uganda): Ndejje University opens water research and development center - “'The center’s activities will be to provide practical experiences to students and local communities in the area of irrigation, geographic information system (GIS), and water testing.' says [University vice chancellor Eliab] Lugujjo." Business Link: New university hub to drive UK’s intelligent mobility agenda - ..."TMC@Nottingham (Transport, Mobility and Cities) is the first-of-its-kind in the UK to run in partnership with the Transport Systems Catapult and launched on 20 November." Turlock Journal (California): Student puts Stan State trees on the map - Stanislaus State senior and Geography major Germán Silva developed an interactive map of the 3,543 trees on campus. Penn State: Geographers create unique wayfinding tool for game day safety - First responders are using a printed grid to communicate the location of tailgaters who need assistance. Siskiyou Daily News: Sisson Fifth Graders Urge Protection of Watershed - For GIS Day, the California students mapped drains and marked them with "no dumping" messages. Penn State: Geography student's VR app offers glimpse into Peru study-abroad experience - Colin Kelly, a senior majoring in geography, is creating a virtual reality (VR) application that incorporates both the scientific and social aspects of his visits to Peru. TAGE: Evolution of TAGE - As of December 31, 2018, National Geographic Society will shut down the Geography Alliance program. As of January 1, 2019 the Texas Alliance for Geographic Education will continue its work under the Gilbert M. Grosvenor Center for Geographic Education in the Department of Geography, Texas State University. I hope other alliances are finding funding and support within their regions. The Intelligencer (West Virginia): West Liberty University Geography, Planning Students Learn From the Pros in Moundsville - The students learned about the connection between geography and tourism and visited The Grave Creek Mound Archeological Complex. It includes the largest conical burial mound of its kind, a remnant of the Adena people dating back to 150 B.C. The Adena people and I share a name, thanks to a former governor of Ohio. Redlands Daily Facts: Esri is buying the Lugonia Post Office in Redlands, and paying to move it - This is "campus" news of a slightly different sort. 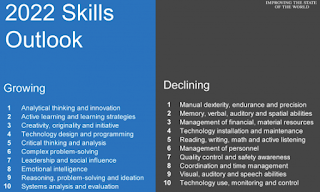 Medium: 5-Hour Rule: If you’re not spending 5 hours per week learning, you’re being irresponsible - This is from 2017, but Michael Simmons has many good arguments for lifelong learning and learning how to learn. I learn quite a lot putting together this newsletter; it's part of my weekly learning time! 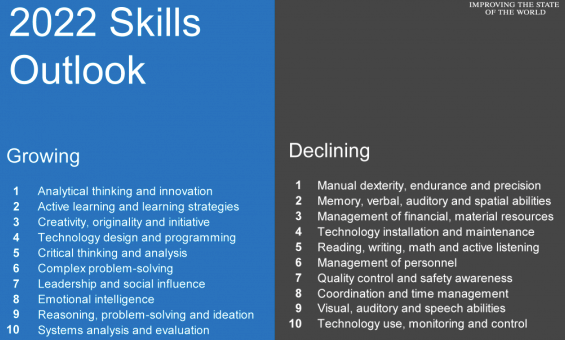 Quartz: These are the skills to learn for the future of work, according to the World Economic Forum - I like that "active learning" is "growing" but am dismayed that spatial skills are "declining." Forbes: Beware of the Great MOOC Bait and Switch - Contributor (see above if you do not know what this means) Derek Newton explains that MOOCs are really marketing for fee-based offerings. That's true and always has been. The Esri MOOC program, for example, is housed in a division called Global Business Development. USGIF: Enhance Your Career with Geospatial Intelligence Certification - U.S. Army or Marine Corps service members working in the geospatial intelligence can now apply for the United States Geospatial Intelligence Foundation’s Certified GEOINTProfessional program and have the Army or Marine Corps reimburse exam fees. (TODAY!) NYS GIS Association: Webinar "Presentation Skills: How to Handle (Almost) Anything" - Dr. Amanda Lohiser, who has a PhD in communications, will be the instructor. Free. USC: 2019 Los Angeles Geospatial Summit - The event is Feb 22. Directions Magazine has a press release with details; USC does not. Student rate: $50. Johns Hopkins: The Online M.S. in Geospatial Intelligence program will host an online Open House on 11 December, 7PM EST. Where would you learn this important information? What is the learning objective of this graduate student assignment? The student posted to Reddit. I'm currently taking a GIS masters degree, and for my geographic information science class I must do a monograph on the application of an open source GIS softwares based on a theme of my own choice.